Hi all, some of you may remember Tank the Rottie that we saved from death row last year! (Not Tank that was used as a bait dog), unfortunately his owner has fallen very unwell and we are trying to assist with finding Tank the perfect home. Please read the message from Tank’s owner below, if you’re interested in adopting Tank please send us a message! He is located on the Gold Coast, all his vet work was completed last year. 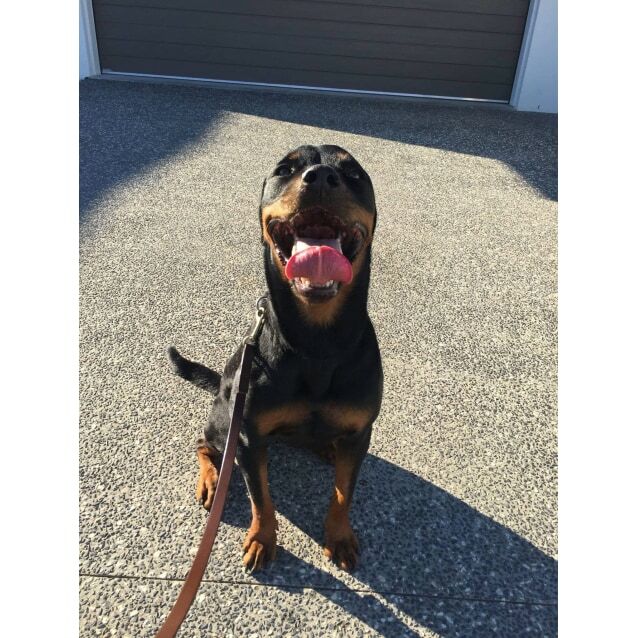 Tank is a purebred 2 year old Rottweiler. Tank is the most loving big boof head with the biggest and happiest smile you will ever see. He lives for cuddles, attention and human interaction. No matter how many times I have told him he isn't a lap dog, he still insists on sitting on your lap, all 48kg of him. He loves to boop noses and give big sloppy kisses. When I got Tanky at 12 months he had no basic obedience training and had not been socialised with other dogs. We have been working with a trainer, and he now knows the basics, sit, drop and wait. He has some recall as long as there isn't too much distraction. When it comes to interacting with other dogs, it depends a lot on how the other dog approaches Tank. If they are over excited, bouncy or showing a lot of assertiveness, Tank does get quite anxious. We had started the process of slowly introducing him to other doggies, which went well and this is something that will need to be continued. He is very food motivated and that has played a big part in his training and how well he has progressed. It's also where he gets his nickname.. Bin Chicken. For now Tank would be best suited to a home with no other pets. He has never been tested with cats. Humans on the other hand, he gets on with everyone big, small, male female. As long as you are giving him pats of course. His human sister is 8 years old and they get along great but she has very strict rules about respecting his space. As Tank can get over excited and turn into big tornado of fur and paws, he would be better off with kids over 6ish just so no one gets flattened when he has case of the zoomies. He sleeps inside at night on my bed, mainly because any beds outside kept magically exploding, all 7 of them! Also because he makes a great hot water bottle. He loves to cuddle up on the couch and makes a great netflix buddy. Tank is very much a dog that needs to be involved with family, he is not a dog that can be left outside all day. He needs a home where someone can continue the training and spend time to help him grow into the fantastic dog he is.